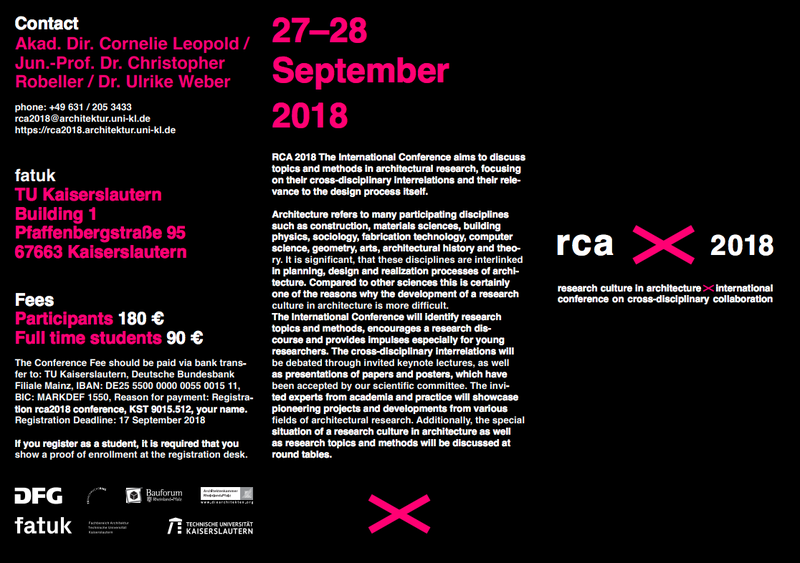 Register now to visit the RCA 2018 conference on cross-disciplinary collaboration in architecture on September 27/28 at University of Kaiserslautern. Meet researchers from leading institutions and groups such as ETH Gramazio Kohler Research, ICD Stuttgart, EPFL Xploration Lab, RWTH Individualised Production IP and many more. Listen to keynotes and roundtable discussions with experts across architectural research including Sigrid Brell-Cokcan, Caitlin Mueller, Michael U. Hensel, Christian Derix ,Margitta Buchert and Eike Roswag-Klinge. 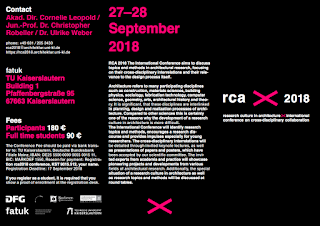 Registration includes the RCA2018 book and dinner. The International Conference aims to discuss topics and methods in architectural research, focusing on their cross-disciplinary interrelations and their relevance to the design process itself. The organizers are interested to see approaches to the development of a research culture in architecture. This conference will identify research topics and methods, encourages a research discourse and provides impulses, especially for young researchers. Founded in 1980, McNeel is a privately-held, employee-owned company with sales and support offices and affiliates in Seattle, Boston, Miami, Buenos Aires, Barcelona, Rome, Tokyo, Taipei, Seoul, Kuala Lumpur, and Shanghai with more than 700 resellers, distributors, OEMs, and training centers around the world.